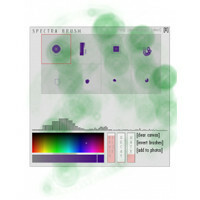 Spectra Brush is a free sound controlled painting app for the iPad. Spectra Brush lets you paint expressively by controlling the shape of the brushes with your voice or any other sound. You can choose between eight different brushes that react to sound in different ways. You can get Spectra Brush here. You can paint on the canvas with as many fingers as you like – just make some noise and move your fingers on the iPad screen. If you tap the [pallete] button in the top right corner you can change the way the brushes behave. There are eight different brushes to select. You can also change the colour by tapping on the colour picker. Brush Size: lets you change the size of the brushes, so you can make broad brush strokes or work in smaller detail. Decay: This changes the rate at which the brush fades away after a sound has been made. Gate: This changes the level of sound needed to trigger a brush. If you set this high, quiet noises will be ignored. If you set this low, any noise will trigger the brush. Clear Canvas: this clears your painting, ready for a new one. Invert Brushes: this inverts the mapping of the brushes. For example, for the circular brush, this makes low frequencies trigger the outer rings instead of the inner rings. Add to Photos: this saves your painting to the photo library, from where you can transfer it to another computer. We’re interested in how people use Spectra Brush. When you first use the app, it will ask you whether you would like to contribute your usage statistics to us. You can change this setting at any time, by tapping the ‘data collection’ button on the palette. All data is anonymous and cannot be linked back to you. If you choose to contribute your statistics, the app will collect data about the brushes you select and the painting gestures you make, and send this data periodically to our servers when you are online.